F2021 Features: -Includes: 6 pumpkin/gourds. -Decorative use only. -Color: Green/Beige. Product Type: -Decorative Accents. Number of Items Included: -6. Holiday Theme: -Yes. Seasonal Theme: -Yes. Holiday: -Halloween/Thanksgiving. Season: -Fall. Generic Specifications: -Product may ship compressed - Primping of branches or leaves may be required to match the image shown. Dimensions: Overall Height - Top to Bottom: -7". Overall Width - Side to Side: -7". Overall Depth - Front to Back: -7". Overall Product Weight: -0.5 lbs. 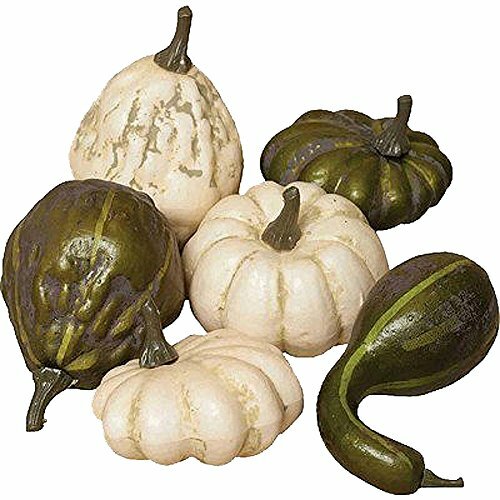 Mesh bag of 6 gourds, very realistic but extremely lightweight. Each measuring approx. 4" x 4"
Great fall/autumn Thanksgiving decor or easy addition to a wreath or garland. If you have any questions about this product by MeraVic, contact us by completing and submitting the form below. If you are looking for a specif part number, please include it with your message.